While an increasing number of investors express interest in impact investing, many are uncertain on how to measure the extent to which their investments make the meaningful impact they seek. Investment managers have long considered factors beyond traditional asset allocation metrics such as duration and credit risk in their portfolio construction processes. The development of emerging investment philosophies such as impact investing requires new analytic frameworks to help optimize both investment return and impact. This need creates an opportunity for advisors to play a significant role. Creating a framework to measure impact is a critical step in the process, but it first requires answering a number of essential questions, including what should be measured, where to find the best data sources and how to ensure that the data will remain timely throughout the disclosure process. Scarcity of food, water, climate change and crumbling infrastructure are problems that can’t be ignored. The United Nations Sustainable Development Goals are 17 broad goals regarding economic growth, social inclusion and environmental protection that are intended to encourage world leaders to address the complex and interwoven elements of sustainable development. The UN SDGs also reflect many of the crucial environmental, social and governance concerns that impact-seeking investors care about, and we believe they offer a great opportunity to introduce impact investing concepts to clients. Achieving all of the UN SDGs for the 193 UN member states would require average annual investment of $5 to $7 trillion. The size of that amount makes it clear that there’s a significant need for funding to have a tremendous impact. By committing capital to helping clients leverage their portfolios to play an active role in addressing these issues, advisors can provide tremendous value. But advisors need to be able to demonstrate that the investments they offer make a difference. In situations where data is sparse, we must also understand the narrative of projects while we seek ways to measure impact. The investment opportunities you recommend to clients must demonstrate not just strong fundamentals, but also an ability to address the impact goals in which your client has expressed a keen interest. It’s important to define the values that reflect your firm’s and your clients’ beliefs. Often, a municipal issuance will contain multiple projects and uses of proceeds. Every bond has a story, and it needs to be clear and concise for each client. Understanding each client’s impact objectives is critical to establishing a solid framework. For example, some may be more passionate about environmental issues, whereas others are compelled to direct their investment dollars toward social causes such as fighting poverty. Defining your clients’ respective impact values will allow you to match passion with purpose. Your job is to help clients visualize what an impact portfolio looks like and why it should matter to them. With the proper framework, goals and measurement, impact investing is a highly attractive strategy for your clients to generate returns while helping to address social and environmental issues that resonate most with them. While the UN SDGs represent the areas where clients seek to have an impact, the municipal bond market offers solutions to achieving these critical goals. The municipal bond market is historically—some would say inherently—fragmented so bringing coherence to it is a daunting task. 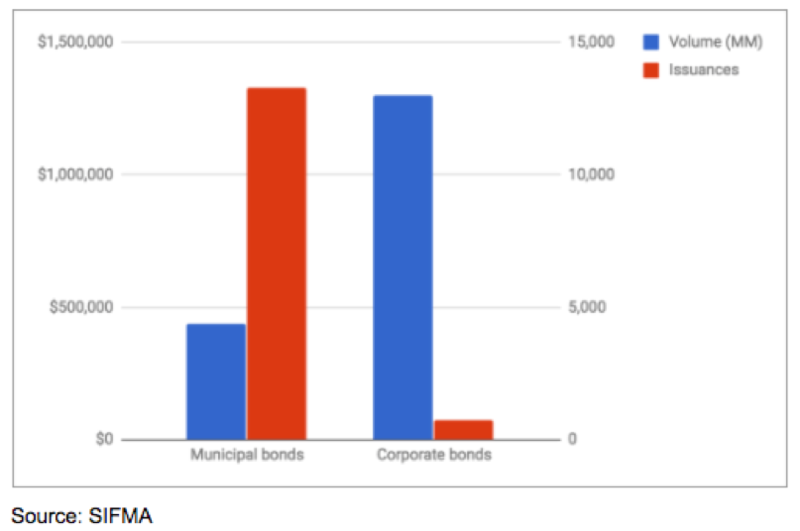 As an example of this fragmentation, consider that the $440 billion worth of new municipal securities issued in 2016 was made up of 13,274 separate issuances. By comparison, the 757 U.S. investment grade corporate bond issues that took place in 2016 were worth $1.3 trillion. With nearly one million outstanding municipal securities and an average issuance size of about $33 million, the fragmented muni market is difficult to organize, measure and track. With so many new issues each year, it can be tough to distinguish the good from the bad, especially as these issuances often include numerous projects with divergent objectives and outcomes. While traditional credit analysts rarely dig deep enough to explore each project, it’s important to be aware that a private prison could be funded directly alongside a new school building. As advisors, your clients rely on you to conduct the necessary due diligence by analyzing not only the issuers and their credit quality, but the measurable impact of the projects that the issuance is funding. If you care about delivering the positive stories that live beneath the surface, it is first important to construct a framework by which to measure impact, starting with the fundamentals. Before participating in a muni issuance, be sure to evaluate the underlying projects that the proceeds from the bond sale go to. By doing so, you can ensure that bond proceeds are being used toward world-positive projects that reflect your clients’ stated values. Of course, sifting through the oftentimes overwhelming number of projects in a bond issuance can be challenging, but as an advisor it’s critical that you’re able to provide clients with a clear picture of where their money is being used and how it impacts their community. Wealth transfer is an important investment objective for many clients today and they care what type of world they will leave for their children and grandchildren. Investment advisors have a fiduciary duty that requires them to put their clients’ interests above their own. That responsibility means they should ensure those clients have accurate and complete information about investment opportunities. Environmental, social and governance data is available for advisors to use to assess risks, allowing deeper insight into the qualitative, non-financial risks facing various issuers. Consideration of this data results in better-informed financial advisors and clients. ESG integration is an essential piece of the risk mitigation process and can be used to drive risk-adjusted returns. As a financial advisor, the opportunity exists to help shape that world by addressing the challenges facing our planet and the people who live on it. Alex Laipple is a Director of Business Development and Impact Investing at Neighborly Corporation. Alex can be reached at [email protected].